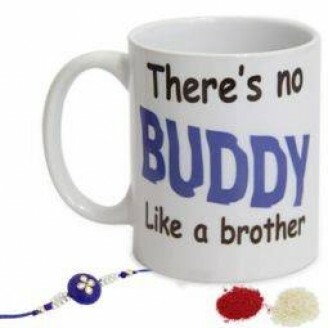 This mug is for your brother along with a rakhi. Same day delivery in Jaipur. And can be delivery across Rajasthan with in 2 days. Preferred delivery option Delivery in 3-4 working days (Via Courier)	Same day (Order before 6 pm)	(+₹100) Next day (Order before 6 pm)	(+₹50) Deliver with cake or flowers, for same day delivery order before 2 pm.